A classic Italian caprese salad is reinvented as bright-flavored panini…and it’s not just for vegetarians either. Sweet heirloom tomatoes and creamy, melted fresh mozzarella are accented by fresh basil and a hint of lemon zest and olive oil on a French baguette. The result is a satisfying medley of flavors that’s quick and easy to enjoy any day of the week. Drizzle olive oil inside both halves of the baguette. On the bottom half, layer basil leaves and tomatoes. Season tomatoes with salt, pepper and lemon zest. Add mozzarella and top half of baguette. Grill sandwich for 5-6 minutes until cheese is melted. Serve immediately and enjoy! Looks great and simple at the same time. I will give it a try soon. Hi, All your recipes are awesome!! I was just wondering if there is a substitute in case I do not have fresh basil at hand? Can I use dried or frozen? Which one is better & close to the fresh basil? Hi Preethi – thanks so much! 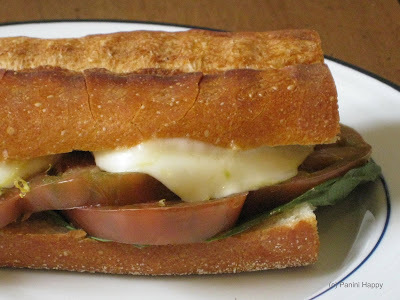 Well, fresh basil really is ideal for this sandwich, but you could give frozen a try. Dried basil has a slightly different flavor – I imagine it would still taste good, it wouldnjust be a little different. wow, this recipe is awesome… cant wait to give it a try. Do you have to use a panini grill or can you use any grill – such as an oven grill? Any kind of grill, skillet or oven will work!